Our rifles are built using benchrest quality, stainless steel and chrome moly actions which provide both the consistency and high standard of craftsmanship which Precision Rifle Services require. Designed and manufactured by Jim Borden, the actions are round bodied with spiral fluted bolts and can be supplied in either Hunter or Standard styles. The minimum tolerance bolt to action fit uses the patented Borden bolt design which adds greatly to the accuracy potential of these actions. The bolts are made in one piece thus limiting the problems of handles breaking off. Finished rifle weights will range from synthetic stocked hunting rifles at 6.75lbs to Match rifles at over 18lbs. Our single-shot actions have cone faced bolts and are supplied with a stainless steel, ADL style trigger guard. Aluminium guards are available where weight is of the utmost importance. The repeaters have regular flat faces to aid cartridge feeding and the footprint of Remington actions so can utilise the same style of hinged floorplate. There is a choice of either the standard Remington factory item in cast alloy or a Sunny Hill stainless steel CNC machined version. The extractor claws are similar to that of Winchester or Stolle and the bolt stops are positioned on the left hand side of the action. Left Hand Actions and opposite port configurations are available at no extra cost. 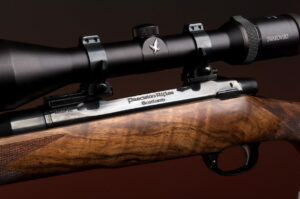 This range of actions is recommended for hunting rifles up to 9lbs as they are lightweight with a large loading port. All Hunter actions are available in 15-5 Stainless Steel and both the HM & HL can be supplied in 4340 Chrome Moly with a black finish. The sides are faceted and the tang is shallow allowing a wider choice of stock style including any of the Remington styles. McMillan stock catalogues available on request. This series is 1.35” in diameter and is available in three different lengths. This series of 15-5 stainless actions is recommended for heavier hunting rifles and target rifles and will accept our whole range of centre-fire cartridges including Lazzeroni Magnums. The loading port is small for maximum rigidity and the heavier tang suits the McClassic, Tactical and Competition styles of stocks. There is a choice of either 1.35” of 1.47” action diameter and as with the Hunter series three different lengths are available. We only use Stainless Select Match and Chrome-Moly Match Grade Barrels from manufacturers who guarantee their product. Parallel rifled blanks are purchased and all additional machining work, except fluting, is completed in house. Barrel profiles can be supplied in various standard and custom shapes to optimise weight, balance and accuracy. Chambering is completed using high quality reamers with interchangeable 0.0001″ increment pilots. Our reamers are ground by manufacturers in the USA to SAAMI or CIP minimum tolerances or to custom dimensions specified by ourselves. Please refer to our current list of reamers for information on which cartridges are available. Barrel finishes are offered in polished and bead blasted (matte) for stainless steel and machine polished, hand polished or matte black for chrome molybdenum steel. Advice can be given on every aspect of choosing a barrel from which cartridge would suit your needs to which twist rate and chamber dimensions will optimise the bullet style & weight that will most commonly be fired through the rifle. We are pleased to help with alternative chambers and wildcat work although a tooling surcharge will be applied to the overall cost of the rifle. Further details of profiles, weights & chambers can be found in our Re-barrelling Section.